1. Most of these audits are conducted in person by the IRS. 2. These audits are very comprehensive and cover issues such as income tax, employment tax, and payroll tax. Proper preparation is crucial for the audit. 3. The determination of the IRS agent is not final. You have the right to appeal against their determination. The audit of your business tax return is conducted in order to verify the authenticity of the information that you have filed. Questions such as whether you included all of your income and filed only for deductions that are permitted by the law are looking into. These audits aren’t conducted at random. Returns likely to have some errors in them are selected by the IRS through a set intricate criteria. The audits begin within a year of filling and are completed mostly within that year. 1. By mail: This type of audit is known as a correspondence audit. 2. At an IRS Office: This type of audit is known as a desk or office audit. 3. In person: This audit is conducted at the site of your business or your home and is known as a field audit. As mentioned above, the majority of business audits are conducted in person, i.e. they are mostly field audits. Field auditing is an extensive task and considered a physical inspection of all aspects regarding owners and their businesses. 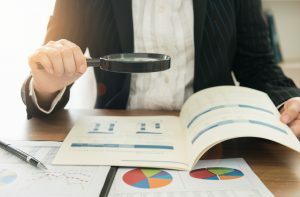 The IRS takes a close look at the accounting system and business records while physical inspections are carried out to deem the authenticity of those records. It can take up to a year for a business audit to be completed (in most cases). However, the audit time can be reduced if a business properly prepares for the audit with prompt responses to the requests and questions raised by the audit team. While the audit is being conducted, the IRS requires you to submit all necessary documents (such as bookkeeping records) that are used to determine your financial position. You should be accurate and precise when providing the information requested by the IRS. It is recommended to have a licensed tax professional to handle your audit-related tasks. You will need to provide your tax professional with the facts needed to handle the audit. Mail Audits are very limited. They include a check on a few items, which are mentioned in the audit letter that the IRS mails you. Office Audits go into more detail. They are generally less complex than field audits but, in certain situations, they may have a scope similar to that of a field audit. Field Audits are the most time consuming. They include questions that probe into the activities of your business and your business’ financial position. It is a wise decision to hire the services of a tax professional to represent your business in front of the IRS. Mail Audit: Preparing for a mail audit is a relatively easy task. You will only have to prepare complete responses to the questions included in the audit letter you received via mail. In simpler words, you must be prepared to answer any sort of question related to your financial activity that has happened during the year for which you are being audited. You will also need to recreate documentation for anything that isn’t documented (or if relevant documents have been misplaced). Third party records or other records must be used for reconstructing such documents. The IRS will increase the number of questions if they think it is necessary for you to change your returns. If you get an IDR (Information Document Requests) which asks for more information about finances, it is important to respond by the deadline in order to avoid any sort of suspicion on the IRS’ side. The IRS may tell you that items such as income and deductions have been misreported. If you disagree with their conclusion, you must represent your interpretation to the IRS. Finally, the audit is closed with the IRS either recommending some adjustments to your returns or accepting your returns as they are. You would, however, be given a 30-day window to appeal their decision.